Who is spending more than $299 on candy? I want to party with that guy. Sometimes you get those crazy ladies that stockpile bags when their favorites go on sale. That is a shopping cart not to get the way of my friend. ACK – my fear is that I am that guy!!! 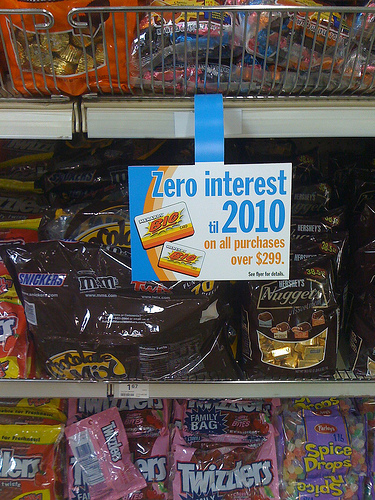 At least they’ll get zero interest on their $299 of candy. I enjoyed the grilled cheese tutorial in your sidebar. Doesn’t everyone butter the bread first? I never thought of using grated cheese. Individually wrapped is simpler, but have you noticed it’s harder to find the end of the wrapper nowadays? What’s up with that? Why do I have the feeling that this was advertising once targeted toward Wilford Brimley?